It was a huge pleasure to be in Ebbw Vale yesterday to celebrate Blaenau Gwent Council signing our Ethical Care Charter – the first Welsh council to sign. Every council which signs the charter means more UNISON members gaining guarantees about their rights and their pay – and better care for the most vulnerable in those communities. That means every signing really matters. Now that Blaenau Gwent have become the first Welsh signatory to the charter, we hope this incentivises other councils to follow suit. 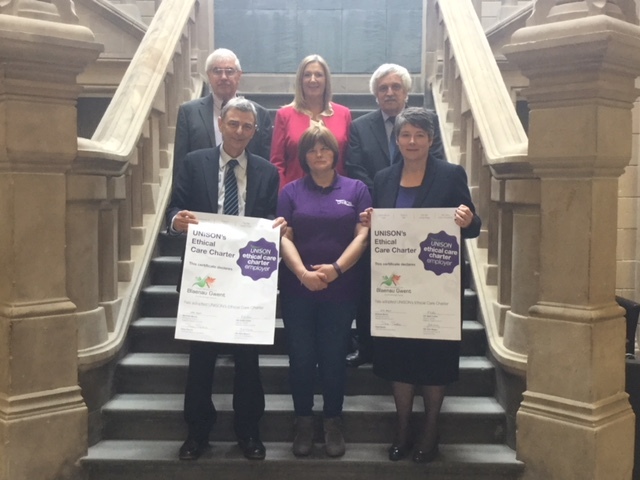 Thank you to Ian, Dave and Isabel from the branch for all of their work in securing the council’s support for the charter, and to the council for their support for local care workers. The Ethical Care Charter is something I’m really proud of, and is a concrete example of how our union can deliver real change for our members – I hope we’ll see many more councils signing up in the years ahead.